Published: May 20, 2013 at 11:14 a.m. Updated: May 20, 2013 at 06:37 p.m.
NFL.com confirmed last Thursday that a warrant was issued for the arrest of former NFL wide receiver Chad Johnson after he allegedly violated several terms of his probation. On Monday, Johnson turned himself in. 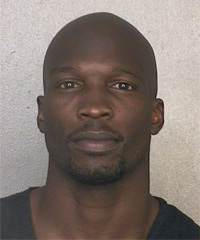 Johnson then was booked into a Broward County jail and later relased after posting bail, which had been set at $1,000. The Los Angeles Times reported Johnson's next hearing is set for June 3. The sheriff's office confirmed last week that Johnson failed to meet with probation specialists on Feb. 15 and March 15. Johnson also failed to show proof of enrollment and completion of the "Batterers Intervention Program." The probation stemmed from when Johnson was charged with domestic battery on his then-wife, Evelyn Lozada, on Aug. 11, 2012.